Nephrotic syndrome in cats can cause edema in your pet which is fluid in their abdominal cavity, or it can also cause acute dyspnea, which is a difficulty in breathing that can lead to panting. Panting in cats is very unusual and is almost always a warning sign that something is very wrong with your pet. However, this syndrome can also very rapidly cause your cat to loss their vision as well as kidney failure. WHAT IS NEPHROTIC SYNDROME IN CATS ? Nephrotic syndrome in cats is a series of symptoms that is caused by a combination of protein in your pet’s urine and as result of this, low protein levels in the body. It also may produce very high and dangerous cholesterol levels as well as large levels of fluid accumulation in their bodies. There are two major causes of this very serious syndrome in your cat. Glomerulonephritis, which is also referred to as GN, and Amyloidosis. Both of these underlying conditions are hereditary or familiar, meaning that it will affect several members of the same litter or the same family. It can also be acquired, meaning that your cat may develop it as they get older, but is not nearly as common. Nephrotic syndrome in cats can attack any cat at any age, as well as any breed. However, it does seem to be more common in middle aged and older casts as well as favoring Asian breeds of cats, especially if the underlying cause is Amyloidosis. There are several very distinct symptoms with this Nephrotic syndrome in cats, but the first symptom that you will see is a difficulty in breathing called dyspnea. Dyspnea will cause your cat a very slow but progressive difficulty in breathing. It is also referred to as air hunger, and as it progresses, your cat will start to pant. Panting is normal in several breeds of dogs, but your cat is not a dog and anytime they pant it should immediately signal you that something is wrong; very wrong. Dyspnea is often associated with a lung or heart disease, and with this syndrome, it is the lungs that are causing the symptoms. The next set of symptoms, which are very difficult to actually see, will surface when your cat stops eating almost to the point of being anorexic. Your cat has now developed edema, which is a condition where a large amount of fluid has developed either in the circulatory system or the tissues between the body’s cells. Eating or drinking causes additional pressure, and as a result, they simply quite eating. This pressure can affect several organs, including their eyes, and the final symptom you see may be a loss of vision. There are two distinctive causes of Nephrotic syndrome in cats; Glomerulonephritis or GN, and Amyloidosis. However, the most common cause is GN. 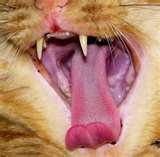 GN is a condition that occurs when the very small blood vessels, called the gomeruli in your cat, starts to leak. Small capillaries are located in your cats kidneys. They allow for a certain amount of both water and waste products to leave their blood where it is eventually passed from their body and than through the urine. Under normal circumstances, proteins are protected by what is called the glomerular filter. However, when this filter malfunctions or becomes defective, it allows for large amounts of protein to leave the blood circulation, passing it through their urine. It is widely held that a deposition of immune complexes triggers an inflammatory action in your cat’s immune system that damages the gomeruli. Once this occurs, it causes proteinuria, which is the loss of protein through the urine. If this is left untreated, it can very rapidly cause kidney failure in your cat. The second potential cause of Nephrotic syndrome in cats is from Amyloidosis, which is a disorder of protein metabolism. This is abnormal amount of deposits of protein referred to as amyloid are deposited into your cats kidneys. The actual reason for this happening is still not known at this time. However, it is believed to be some type of hereditary problem that affects predominately Asian breeds, especially the Abyssinian breed. However, it can also affect mixed breeds and occurs much more commonly in older females and the deposits of protein in the kidneys leads to chronic kidney failure if it is not treated. It can, however, spread and affect other organs such as the liver, spleen, and pancreas. Treatments for Nephrotic syndrome in cats will all depend on how seriously your cat is affected. If they are stable, they can be treated as outpatients by your veterinarian, otherwise they will have to be hospitalized. The first form of treatment will be antibiotics to control any type of an infection, but this will quickly be followed by a modification of your cat’s diet. The will be placed immediately on a low salt and low protein diet to slow the loss of protein in their system. If your cat is in any of the stages of kidney failure, they will need intravenous fluid therapy. If they have a large build up of fluid, this will have to be addressed by diuretics to remove the fluid. Your veterinarian may also choose to treat this with a very low dose of aspirin, but this is extremely dangerous because of aspirins toxicity in cats and should only be done by your veterinarian. Nephrotic syndrome in cats can be a very serious threat to your cat, but it can also be successfully treated if identified early. you understand the symptoms and seek treatment as soon as possible, your cat should live a normal life after treatment. But there is still one very perplexing problem with this syndrome; there is still no known or documented prevention.